#9 X 2-1/2 Inch HWH SHARP POINT SCREW WITH EPDM SEALING WASHER. ZINC + SENTRI FINISH. 250/BAG. PRICE/BAG. 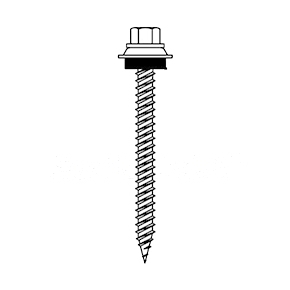 (SFS WOODGRIP #C0461-CCP) Self-tapping sharp point screw for fastening directly to wood members. Hex-head with weatherseal washer. Zinc Plated and Silver Sentri Coated for corrosion protection.